Sometimes a new gadget is just really cool-looking. It hits all the right aesthetic notes, boasts a flashy new technology and looks like something you want. But whether it’s something you need—or will be willing to empty out your wallet for—is another matter entirely. Here’s something that seems to fit this category, for now. Per Bloomberg, on Tuesday Samsung Electronics mobile business president Koh Dong-jin said the company is planning to release a phone with a flexible display next year—though the development process for a consumer-ready product could be hindered by various technical challenges Samsung still needs to resolve. Samsung first displayed a flexible OLED prototype in 2013 called “Youm,” meaning it’s had a few years to work out issues already. 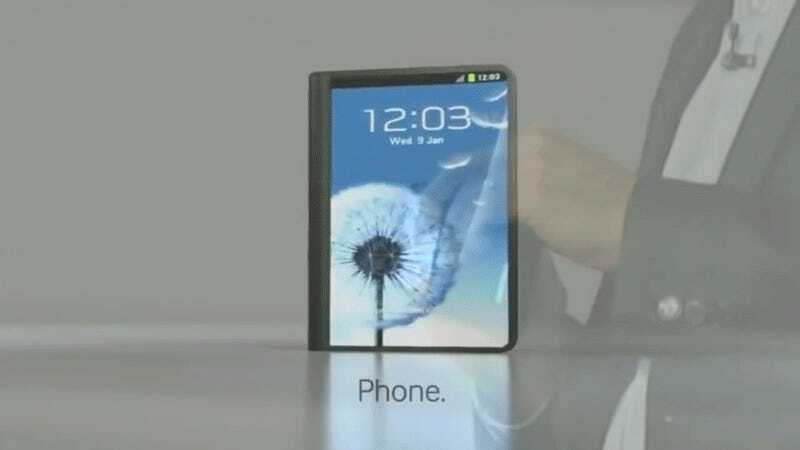 Speculation and rumors about the imminent release of a flexible Samsung phone have been circulating for years. Video of supposed prototypes circulated online that year. It’s really sort of hard what to make of them, though; the designs ranged from a clunky device with the same shape and hard shell of a cosmetic compact to retractable screens and folded models ready to expand to tablet size. All of them had clunky form factor; judging from the Bloomberg report the folding version of the phone is the current working idea. Historically, the flip phone idea has been pretty archaic ever since smartphones transitioned to full touch screens, and recent entries in the genre have mostly (with some exceptions like Samsung’s Leader 8) been seen as nostalgic throwbacks. A flexible touch screen might breathe some new life into the concept, or it could just end up as a gimmick. Sometimes simplicity is better if there’s no actual use scenario where a complicated concept doesn’t improve the user’s experience. Folding the phone out into a tablet-size device sounds cool in theory, but might end up being a flashy trick with little real utility. The market for tablets has already crashed as current phones have caught up in power and closed the gap on screen size, so luring people back to the phablet concept might be difficult. Most current smartphones aren’t exactly impregnable to mankind’s ancient enemies: water and pointy rocks. There’s some anecdotal data suggesting old-style flip phones were more durable, but that’s because they were small and cased in plastic, not glass. Whether or not a flexible display is more or less susceptible to the elements and gravity than a current-gen phone will ultimately be a major factor in most consumers’ decisions. Some of the Samsung prototypes showcased previously look like they might not be able to fall off a coffee table without sustaining serious damage. One of them has screens on the front and the interior! Moreover, putting the frame of the device in motion runs the risk that a single crack could fissure throughout the device’s entire screen, turning what would be minor damage into another phone into a total loss in the flexible one. To be fair to Samsung, the underlying concept here is really cool. Said concept also needs to prove it’s more than just a gimmick, which could take a few generations of development. Since rumors have been floating Samsung would release something like this for years, it’s probably better to wait and see before declaring this the next threshold of mobile tech.